A Cruiser Motorcycle and an RV, a Sweet Mix! Combining my V Star Cruiser Motorcycle with our Fifth Wheel has been one of the best decisions I've made in this journey. Just 'cause I gotta wear a hat to keep my bald Ol' pot from cookin' is no reason to snicker! anyway... back to the wind in your hair... it's the mechanized definition of Shining Times! A joy without a superior. When I brought Slick... my Yamaha V Star Motorcycle home, after having gone too many years without a bike, That bike quickly reminded me, just how much I'd missed the Freedom of the Road, that you can only find on a Motorcycle. Sweeten that Freedom, with the extra good fuel economy you get with a fine Cruiser... add up the cost of fuel these days... and then subtract the fuel your Motorcycle didn't burn... and you'll agree, you've hit the Jackpot! Hmmm... wonder if that economy is what the huge surge in bike sales, the past few years, has been about... or just that somebody let the secret out; just what a joy they are to ride! I also thought it was an especially shiny idea, considerin' that a consequence of acquirin' that Yamaha V Star Motorcycle has been the unexpected motivation to start a whole new website dedicated 100% to Motorcycle Touring! Then... If you've got any interest in using Motorcycles as the absolute best RV Toad! or Cruiser Motorcycles in general... look around here once in a while too... 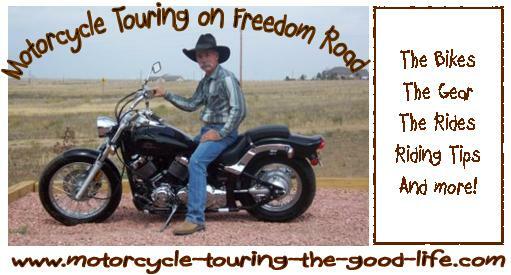 I'm hopin' to put something in one of the two places to tickle your Cruiser Motorcycle fancy.